Take on Glinda's wise and benevolent attitude in this gorgeous dress. The dress features a satin torso and sheer nylon sleeves that have a puffy, yet graceful quality to them. A triple-layer, full-length skirt falls from the waist. The layers are satin, mesh and silky nylon, and silver trim around the waist and neckline adds class and loveliness to the gown. 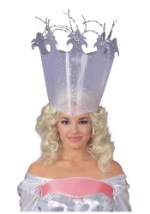 Get our Glinda crown and wand to make this costume look even more authentic!